Explore America’s first national park as a wonderland of ice, steam, and snowy landscapes on these small group adventure tours. On these winter tours discover the rivers, lakes, and geothermal splendors that pull visitors from all over the world to Yellowstone, America’s first national park. Animal tracks in the snow; geothermal steam colliding with cold temperatures to coat the surroundings with frosty condensation; golden canyon walls contrasting with snow; bison, elk, coyote, wolves, eagles, bighorn moving in their winter habitat–expect these images as you enter the wintry landscapes of Yellowstone National Park. 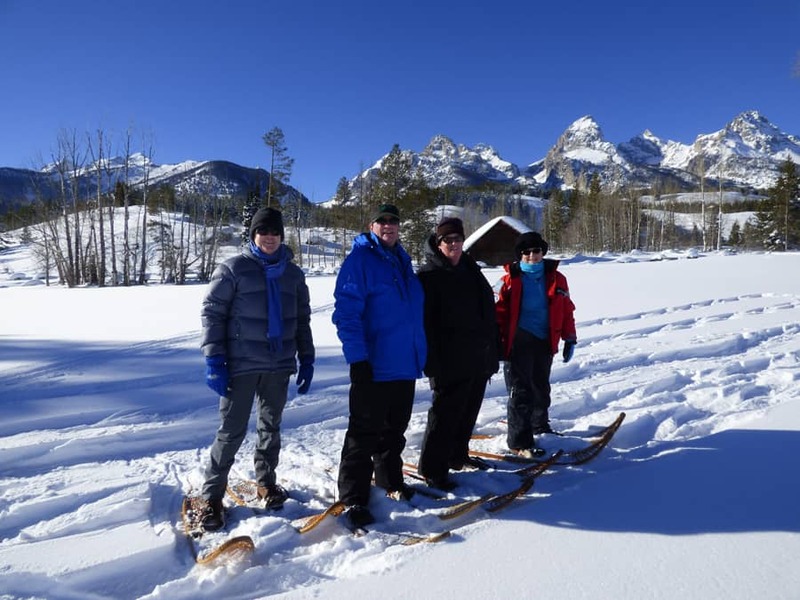 Combining the comfort of heated transportation and cozy lodging with the vigor of outdoor activities in winter, this tour offers a once-in-a-lifetime experience of these famous national Parks and winter impressions of Utah, Idaho, Wyoming, and Montana. Enjoy this extraordinary small group tour with no more than 10 participants, guided by a knowledgeable tour guide and a driver. Please note that our itinerary is subject to small changes to account for weather conditions. For further information about our Yellowstone Winter Tours see the Winter Vacations Yellowstone Overview Page. Welcome to Jackson, WY. Meet your group in the lobby of the hotel in the evening. Travel Dream West invites you to enjoy appetizers and drink. You get to know your traveling companions at dinner, and your driver/guides who hand over important travel information and travel documents. Today’s highlight is the Teton National Park. In the morning, a horse-drawn sleigh offers a chance to get a close-up look at the wild wapiti herds outside of Jackson. We eat at lunch in one of the good restaurants in Jackson. Weather permitting, we join a naturalist/ranger for a guided snowshoe walk (no experience needed, just like hiking). We discover wild-animal tracks and with a bit of luck some deer or moose. Evening in quaint western town Jackson Hole with its beautiful galleries and good restaurants. Today we drive over the Jackson Pass to Idaho. Choose between two options, explore Harriman State Park, using shoe-chains, snowshoes or cross-country skis, or rent a snow mobile for the afternoon. We spend the night at a rustic lodge on the Snake River. Take a snow coach from West Yellowstone into the Yellowstone National Park, inaccessible to regular traffic during this time of year. Look for wildlife in the snow Madison River area, and stop at the Norris Geyser Basin, the most active geothermal region within Yellowstone NP. Next a visit to the Grand Canyon of Yellowstone with impressive waterfalls which can be surrounded by frozen icicles. Return to West Yellowstone for a comfortable night in this well-located town right by the park entrance. Stop at the Bear and Wolf Center in West Yellowstone. Dependent on the weather we continue our drive to Earthquake Lake where visible signs of the last great earthquake can easily be observed. Travelling onward we explore ghost towns in Nevada and Virginia City in Montana. Stop at Livingston, Montana. In the evening we arrive in Gardiner, a small town near the north entrance of Yellowstone NP. In the morning we take Yellowstone’s snow coach to the upper Geyser Basin. 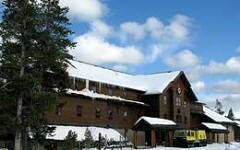 We will check into cabins at the Old Faithful Snow Lodge deep in Yellowstone National Park. In the afternoon we will explore the area around Old Faithful, with it’s many geysers and hots springs. Keep an eye out for bison who frequent this area this time of year. 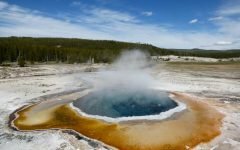 There is a lot to explore in this area, visit Old Faithful, Morning Glory pool, and riverside geyser. There are many hiking trails available, or you can rent snow shoes or cross country skis. Guided tours are also available. Today you bid farewell to Old Faithful and embark for the snow coach ride to Mammoth Hot Springs. This is a half-day drive through snowy Yellowstone, wildlife included. Met by our tour bus at Mammoth Hot Springs, we check into our cabins with kitchens in Gardiner on the banks of the Yellowstone River for the next two nights. Gardiner has good restaurants and places to buy groceries. Today we explore the area around Mammoth then drive into the wildife rich Lamar Valley, home to many bison and elk. With some luck we’ll also spot some of the rarer animals, including wolves. Today we depart for Chico, where a welcoming Resort makes for a comfortable stay, complete with a hot natural mineral spring. Relax and enjoy. Optional activities include a day spa and massage treatment. For those who are more adventurous a mushing class will teach you the basics of guiding a team of sled dogs. After thorough instruction you can choose to take your own team of dogs for a sled ride through the countryside, or hire a seasoned musher (dog sled leader) to take you into the wilderness. Relax again this morning in the hot springs, and enjoy nature walks. After lunch, we leave for Bozeman, Montana. This medium-sized university town has an appealing historic downtown with many stores and good restaurants and a mall for last minute shopping. Night in hotel with complimentary airport shuttle. Our tour ends today. Transfer to airport and flight home. If you have any questions please feel free to contact us at info@traveldreamwest.com. These Yellowstone winter vacations leave in January 2014 and can be reserved for a group as custom adventure travel tours.